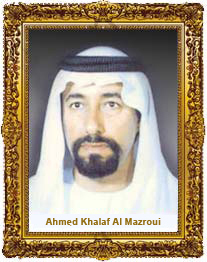 Mr. Ahmed Khalaf Al Mazroui, Our leader and Chairman, is the founder of Ahmed Khalaf Al Mazroui Group. We call our Chairman, with conviction, as the doyen and architect, who has contributed all his might for the development of AKM Group to the present state. He held "Honourable Positions" in the Federal National Council, Abu Dhabi Municipality, Abu Dhabi Chamber of Commerce & Industry, etc. from time to time and accomplished all the tasks vested in him with rare efficiency, besides actively involving in business, construction and trading with the farsighted - foresight to develop the AKM group into a gigantic organisation of repute with the central purpose to generate surplus funds, create employment opportunities, and all rolled into one objective- Become a contributor for National Development. Mr. Ahmed Khalaf Al Mazroui by virtue of his ever vigilant approach, honesty and strong business acumen, now stands as a cynosure, not alone in the Oil & Gas business field but also pervades in the Civil Engineering, Building construction, Sewage and road construction, Electricity projects, transportation & Vehicle hire, aluminum projects , design, accommodation and catering, travel & tourism, Dairy Products, Cold Stores , Freight forwarding & Clearing, Chemicals, Pharmaceuticals, medical & hospital equipments etc. Mr. Ahmed Khalaf Al Mazroui, a born Charismatic leader, leads our team with situational leadership style, dynamic imagination, untiring enthusiasm, never ending optimism, unerring determination, and purposeful direction, with the only one cardinal value. "MAKE THINGS HAPPEN"